Generating - Bulk (all competitions at once). Once competitions have been created / teams assigned to competitions fixtures can be generated. 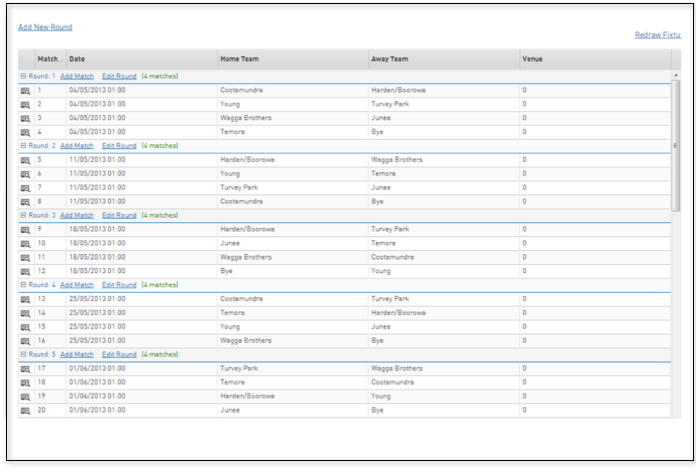 To generate fixtures in bulk select bulk fixture generation from the competitions tab as shown below. Select the season, check the box next to the competitions to be generated and select the icon – fixtures for the competitions will now be generated. 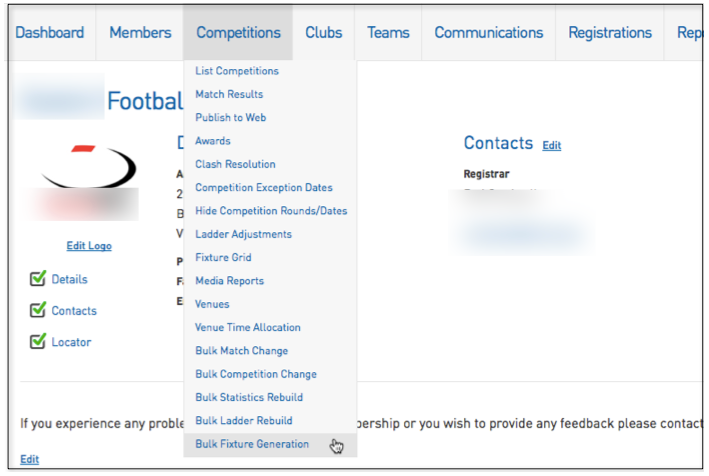 Navigate to the relevant competition from list competitions and select the icon » Select the fixtures tab from the top navigation menu as shown below. Click generate fixtures – all fixtures for this competition will now be generated – repeat this process for all competitions. Navigate to the relevant competition from list competitions select the icon and then fixtures – regular season from the top navigation menu. All fixtures for the current competition will be displayed as per below screenshot, click on a field such as the date/time – home team – away team – venue to change any fields when the change has been made click enter to lock in the changes. Alternatively select the icon next to the match you wish to update make the changes from the drop down box available and select Update Match. To add a round to a competition click the Add New Round button and complete the number of matches to be played. Matches can be added by selecting the Add Match icon which appears next to the round number.